The United States is taking advantage of a power vacuum in Yemen to bomb Al Qaeda terrorist bases. Yemeni President Ali Abdullah Saleh is in Saudi Arabia receiving treatment for serious wounds sustained in a major attack on his palace last Friday. Along with Saleh, the government’s Prime Minister, parliament speaker and four other high-level officials were also injured in the attack which took place while the men were at prayer in the compound’s mosque. Vice President Abed Rabbo Mansour Hadi is meanwhile in control of the government, which at best is struggling as the opposition tribal confederation headed by Sadeq al-Ahmar presses ahead to topple Saleh’s regime. According to an article published Wednesday, June 8 in The New York Times, an Al Qaeda operative was killed in southern Yemen last Friday by American fighter pilots. Abu Ali al-Harithi was a central figure in Al Qaeda in the Arabian Peninsula (AQAP). Released in 2009 after a three-year prison term, he was believed to have fought alongside deceased Jordanian-born Iraqi Al Qaeda leader Abu Musab al-Zarqawi. However, he and several other terrorists were not the only ones killed in the air strike; at least four civilians died as well, according to eyewitnesses quoted by the newspaper. These collateral deaths are a concern for U.S. officials who fear pushing Yemeni public sentiment towards, rather than away, from the jihadis (radical Islamist warriors) mingled among them. An assassination attempt aimed at American-born radical Muslim cleric Anwar al-Awlaki failed, just days after the successful Navy SEALS operation that killed Al Qaeda founder Osama bin Laden. Awlaki, who has emerged as one of the top leaders in AQAP, is considered – together with the Yemen-based group – to represent the gravest threat to the United States. He has been linked to the Ft. Hood massacre in the United States, the Christmas 2009 terrorist plot to blow up a U.S.-bound passenger plane, and a plot to blow up cargo planes. The missiles fired by U.S. military drones at a truck in which Awlaki was riding in the Shabwa province represented the first known U.S. air strike in Yemen since May 2010. 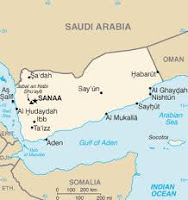 Shabwa is considered an AQAP stronghold.